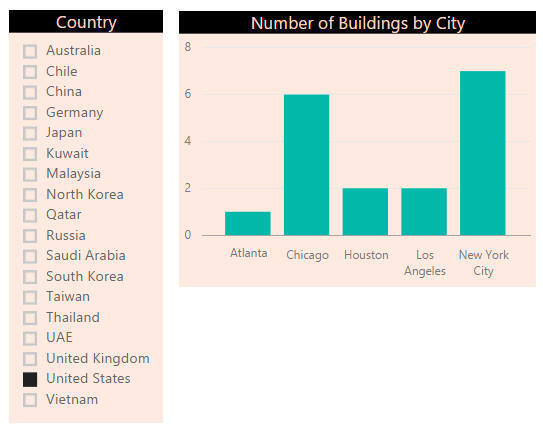 Create a new Power BI Desktop file, and import tables from the Wikipedia list of skyscrapers (you can find the link you need at this page). At the time of writing, this is the table you need to import. If you haven't got Internet access or the data above has changed, you can instead load the CSV file from the above folder. The list of buildings after tidying up. You'll need to do a fair amount of column renaming and data type changing, among other things! The buildings in floor height order. 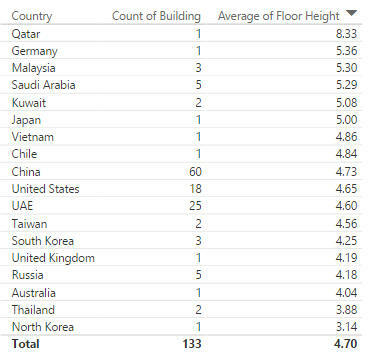 Qatar may have only one building in the list, but it has mighty high floors. What you should see if you choose United States. Your slicer should not allow multiple selections. Save your file as Size is not everything, then close down the instance of Power BI Desktop.